Hello… I’m Stephen. I live in Baltimore, Maryland, USA with The Great Spousal Unit, Maureen. I’ve been living with Type 1 Diabetes since January 1991. I’ve been a pump user since April 2010, and I’m currently wearing the Animas Vibe pump. Also wearing the Dexcom G5 continuous glucose monitor. I’m always searching for the perfect balance between the highs and lows of my blood glucose level and my life… always searching for the Happy Medium. Anything you’d like to share? Please let me know… I’d love to hear from you. I’m finally getting used to our quarterly full council and Diabetes Committee meetings. It takes some preparation, but also preparation at the right time, so I, along with my more-than-capable co-chair of the Diabetes Committee, can present the latest and greatest on what the committee is working on, but also explain why we’re working on what we’re working on. As far as committee meetings go… that’s required even more involvement. Instead of the quarterly meetings we’re required to hold, we’ve committed to monthly meetings since beginning the ardent task of framing the state’s first comprehensive diabetes action plan. The work is ongoing, but I’m finally starting to feel like we’re making progress, and that’s good. Hopefully, I’ll have more to tell as we start to pull the various parts of all this together. I should mention that we’re all indebted to the various staffers at the Maryland Department of Health who have been working with us during this time. They have provided guidance, data when we need it, and a lot of patience as we navigate this process. This is their job, but they’re doing it at times that are not always normal office hours, and I admire their dedication. One other part of my council duties that I probably haven’t mentioned before is my role as part of an ad hoc legislative committee. Our council is comprised of four committees (Diabetes, Heart Health, Arthritis, and Physical Fitness), and we each chose a representative for the legislative committee. Maryland’s legislative session runs only from January until April. When bills were introduced in the House or Senate, if the Department of Health saw a potential role for the Advisory Council to weigh in with either support or opposition to a bill, it was sent to our committee for review. In very short order (usually 72 hours or less), we needed to read the bill, decide whether to support, oppose, or take no position on a bill, with written reasons that support our point of view. One such piece of legislation was Senate Bill 410, which, among other things, would have eliminated co-pays for insulin and test strips for Marylanders insured under anything other than a high deductible insurance plan. Naturally, since people on HDHPs are the most negatively affected by climbing co-pays, it was unfortunate that they were left out of the bill. But, it would have been a huge win for everyone else, so the council was overwhelmingly in support of it. I was even able to add some of the wording and data for our letter in support of the legislation, which may have been my proudest moment serving on the council so far. Unfortunately, the bill didn’t make it from the Senate over to the House, and the bill is dead for this year. If it comes up again next year, I hope we can get it through to passage. Overall though, my work on the legislative committee has been instructive and fulfilling. Finally, I want to remind anyone from my state that our council and committee meetings operate under laws that ensure that we have a free and open process while we perform our duties. You probably would think that attending a meeting would be boring, but you are welcome to attend. For the record, the next full meeting of the Maryland Advisory Council on Health and Wellness is on July 17 at 4:00 p.m. If you want to know more, just ask me. And if you have an interest in something like this… if you want to serve others, be part of something bigger than yourself, then go for it. There’s nothing that qualifies me for this role, other than the fact that I’m a passionate advocate and I have a little experience with this sort of thing. You likely have the same qualities, or even better ones. Your community could benefit from your interests, and your perspective. Service to the community is noble and important. As I’ve asked so many times here… Why not you? I came home from work the other night, walked the dog (like you do)… then, I went into the kitchen to see what I could do about dinner. I should mention that I was finishing up a bad infusion site, and my blood sugar was over 200 mg/dL most of the day. In fact, I had skipped lunch because I couldn’t bring my number down and I didn’t want to go even higher. I was hungry. First, I performed the site change, and then I opened up the fridge. I needed something that would fill me up, but not affect my blood sugar too much while I got the BGs sorted out. I had part of a steak leftover from a couple of days earlier. And a brand new head of iceberg lettuce. I usually prefer romaine, or spinach, or just about anything other than iceberg, but there it was. And suddenly, I thought: maybe I could try to make a wedge salad like the ones that became so popular about ten years ago. 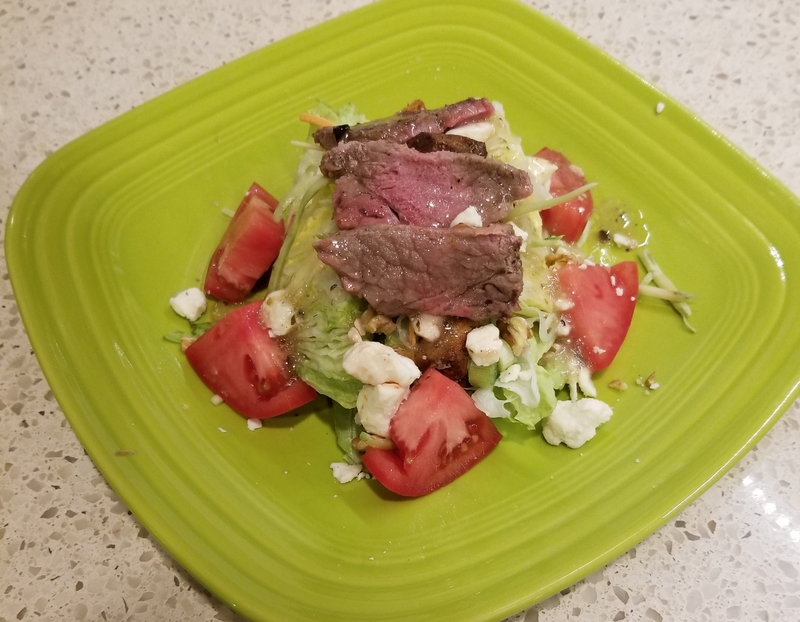 To be honest, whenever I think of a wedge salad, I think “easy salad”… how hard can a salad be if you don’t even chop the lettuce? Well, it really is that easy. Finally, I’m right about something. I added green onion, a little shredded broccoli/carrot mixture, chopped walnut, and tomato. On top of that, the leftover steak and some feta cheese. A little crushed black pepper and greek salad dressing, and I was ready to go. Hey look, making a wedge salad is about as easy as it gets in the kitchen. The point isn’t that I did some chefy thing. The point is that I had fun doing it. I took a ridiculously boring idea (salad) and enjoyed the idea of crafting something that I hadn’t tried before. It was easy, but it wasn’t boring. That’s the point of cooking for me: use what you have, make it as well as you can, and enjoy the process. You’ll usually come up with something that’s good for you, is lower in calories, and is pleasant to your CGM trend line. Do something in the kitchen you’ve never done. Have some fun. I guarantee you will love the process.